I'm an American Christian, so the study of the Feasts was new territory for me in 2013; particularly, I've struggled to make sense of Yom Kippur. How does this fit into the plan? If Christ fulfilled the Spring Feasts with his first coming, I'd get through Rosh Hashannah but then "What happens next?". Honestly, I still have much more study to do, but here is what I do know. To look at this from a Feast perspective (Moedim - God's Divine Appointment), it is of note, that the redemptive sacrifice of Passover is the Lamb which saves you. The blood of the lamb saved Israel in Egypt and the Messiah's role as the Passover Lamb, once and for all, saves mankind. (Hebrews 10:10). The reconciliation sacrifices of the Yom Kippur, are goats which symbolically cover sin but do not save (Hebrews 10:4). So, Israel participates in the Day of Atonement as a temporary covering, offered on behalf of the nation of Israel, by the high priest. The very act of letting the high priest make the sacrifice and accepting it as your own is prophetic. Spiritual Truth: The fundamental difference between the lamb and the goat is that one saves and other temporarily covers. Taken together, one can extrapolate that since the church is never under the covenant of animal sacrifice, (which resumes in the Tribulation and the Millennium) then the church stops being part of the feasts at the Rapture, meaning that Yom Kippur and Tabernacles are fulfilled at the Lord’s Second coming but without a role of the church! Passover will be celebrated during the Millennium, along with the Feast of Tabernacles for the Nations (Ezek. 45:21-25), it is possible that the New Covenant with Israel (Jeremiah 31:31-34) will omit the other Feasts because Christ's fulfillment of them is complete. 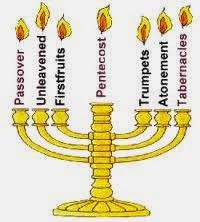 The order of the Feasts is Prophetic in their order - it starts with the Passover Lamb and ends with the Redemption of the Nations and God dwelling among His People. Blessed be the Name of the Lord.